Sensory loss occurs when there is damage to the cochlea, the end organ of hearing that lies deep within the temporal bone. Researchers are learning a lot about cochlear function but there are few medical treatments available at present. Because the cochlea cannot really be medically treated, amplification and/or audiologic rehabilitation are the main and most effective treatments at present. Many conditions that occur within the cochlea result in the loss of outer or inner hair cells. 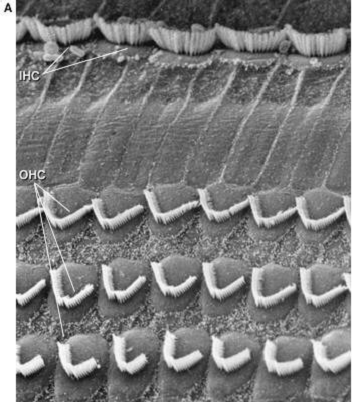 Photograph A) below shows healthy stereocilia, projection from the tops of the outer and inner hair cells through the membrane covering them. 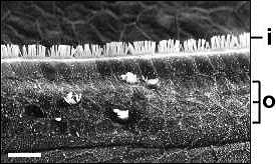 See healthy stereocilia, from the tops of the outer and inner hair cells through the membrane covering them in photo A. 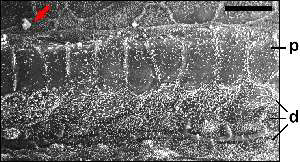 Photos B, C and D show various losses of inner and outer hair cells resulting from some insult to the cochlea. A) A picture of healthy stereocilia. B) The outer hair cells have mostly been destroyed. Loss of outer hair cells is thought to be the most common form of cochlear damage and to underlie most cases of sensory hearing loss that range from mild to about moderately severe. Researchers hypothesize that severe to profound sensory hearing loss includes loss of outer and inner hair cells. C) The outer hair cells have mostly been destroyed. Loss of outer hair cells is thought to be the most common form of cochlear damage and to underlie most cases of sensory hearing loss that range from mild to about moderately severe. Researchers hypothesize that severe to profound sensory hearing loss includes loss of outer and inner hair cells. D) This picture demonstrates loss of only inner hair cells, which is somewhat uncommon. The amount of hearing loss will be governed by how loud the sound was. In most cases of acoustic trauma the outer and middle ears are not damaged and rarely one might see tympanic membrane ruptures and/or ossicular disarticulations. If there is outer ear or middle ear damage it is first and foremost a medical problem which the physician will treat before an audiologist offers any treatment. Most damage from acoustic trauma occurs in the cochlea; the high pitch areas of the cochlea are more susceptible to damage than the low pitch areas. 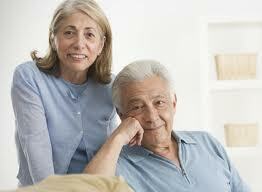 However, the hearing evaluation can reveal anything from a mild loss to a profound hearing loss. The inner ear (IE) is one of the most complex systems in the human body. The fluids in the IE are protected by tissues that allow only some of the body’s fluids and molecules to enter. Antibodies, also known as immunoglobulin, are proteins that the immune system uses to identify and get rid of foreign objects like bacteria and viruses. If immune components such as immunoglobulin get into the inner ear, that exposure can produce localized immune response and possible hearing loss. This hearing loss is caused by autoimmune inner ear disease, usually occurs in both ears, called bilateral loss, and is progressive but at different rates in each ear. Whenever the amount of hearing loss is different in each ear it is called asymmetric hearing loss. Physicians may find it difficult to diagnose autoimmune inner ear disease and often have an extensive protocol of tests to determine the underlying pathology. Included in these tests may be a CT scan and/or an MRI in order to rule out other causes for the sensorineural hearing loss. Individuals with AIED may also have vestibular problems or balance difficulties. If these problems are present they tend to be episodic and between these episodes the person may exhibit ataxia, walking with a very wide gait to keep from falling down. Treatment for autoimmune inner ear disease is often a steroid such as prednisone. Hearing levels may recover to some extent, but few people regain absolutely normal hearing. In many cases the physician is interested in stopping the progression of hearing loss. The important idea for VR Counselors is that this hearing loss occurs very quickly with no ‘warning’. If medical treatment is somewhat successful or not successful, these individuals will be functionally impaired almost immediately and obtaining audiologic treatment and VR services as quickly as possible will be important to and for them. Ménière’s disease or Ménière’s syndrome is characterized by a low frequency sensorineural hearing loss that changes over time. The low frequency sensorineural loss in Ménière’s is rare, as most other damage to the cochlea causes high pitched sensorineural hearing loss. Ménière’s is said to be caused by endolymphatic hydrops, a condition with too much fluid in the inner ear. The excess fluid can cause hearing loss and balance disorders. Another symptom commonly reported is roaring tinnitus, something like the roar in the seashell. Ménière’s symptoms are episodic. This means that symptoms occur, the person experiences hearing loss, dizziness and tinnitus and then those symptoms recede. The individual may have no problems for weeks, months or even years, until another episode occurs. The time between episodes is generally completely symptom-free. Individuals who suffer from Ménière’s just don’t feel good. The symptom that negatively affects most people is the dizziness. Physicians typically treat symptoms so patients feel better. Physicians may suggest reducing caffeine and salt, which many people say helps to some extent. But these changes will not cure the Ménière’s; the mechanisms underlying this disease are still not understood. There are also several surgical procedures that might be used in cases of intractable vertigo. Audiologic treatment for Ménière’s includes personal amplification and/or assistive devices. Exposure to noise that is loud enough can damage the cochlea. Noise comes in two varieties: “continuous noise” that remains relatively constant for at least one-fifth of a second, and “transient noise”, any sound that is shorter than one-fifth of a second. Often, transient sounds or more on the order of milliseconds or tens of milliseconds (that is, thousandths of a second). These transient sounds are the sounds that cause acoustic trauma (discussed above). Continuous noise results in what audiologists term “noise induced hearing loss” or NIHL. Researchers have discovered that workers exposed to noise and some chemical substances (such as toluene and xylene) simultaneously can suffer greater amounts of hearing loss and cochlear damage than if they are exposed noise alone. For a person with NIHL the history they present may be somewhat vague. However, the audiologist will ask about noise exposure activities and medical history to uncover possible causes for the hearing loss. Tinnitus, or ringing in the ears, may be the presenting complaint as well as difficulty understanding speech in a noisy background, which is perhaps the most common complaint of everyone who has cochlear hearing loss. The audiometric configuration of NIHL has a characteristic dip at 4,000 Hz. Over time the loss will progress to lower frequencies. At first, frequencies above 4,000 Hz have the better thresholds but as a person ages, these thresholds may become poorer as well. There are several medications that have ototoxic properties. The two largest categories of ototoxic medications are the aminoglycoside family and some members of the platinum chemotherapy drug family. If an individual is in need of any of these drugs hearing loss is often a secondary consideration because their life may be at risk. However the medical field takes care to use ototoxic drugs as infrequently as possible. These drugs have different levels of ototoxicity, and other factors such as dosage and duration of taking the drug can have effects. In addition, some drugs will affect the cochlea more while other drugs may affect the vestibular, or balance system more. We now know that a genetic change in the mitochondrial DNA, ‘A1555G’, makes the individual very susceptible to hearing loss given even modest amounts of aminoglycosides. The hearing is usually completely destroyed rapidly. Audiologic treatment should begin as quickly as possible, and services from vocational rehabilitation will be critical for these individuals to continue to function well day to day. Typically labeled ‘hearing loss due to aging’, presbycusis has recently been shown to have a definite genetic component. A person’s genetic makeup interacts with the environments in which they grow up and live (for example, noisy or quiet job, exposed to ototoxic medications or not), that determine when, how fast and how much cochlear hearing loss they will suffer. In the past we thought the environment one lived in was the biggest contributor to presbycusis, but we know now that genetics plays a much larger role than we thought. As of 2011, at least two gene mutations have been identified in individuals with presbycusis, with another four genes thought to contribute. In addition, diet, stress and other systemic conditions such as diabetes, may also add to hearing loss in the ‘presbycusis’ category. The hearing loss configuration most often seen in presbycusis is labeled ‘sloping’; the X’s and O’s will be normal or near-normal in the low pitches and will move down the audiogram (worse hearing) in the mid- and high frequencies. A fairly new type of hearing loss that has recently been shown to have a genetic basis is auditory neuropathy spectrum disorder (ANSD). ANSD is characterized by normal functioning of the outer hair cells, and therefore some hearing tests ( otoacoustic emissions), are normal. With ANSD, the signal becomes ‘corrupted’ when it reaches the inner hair cells and must cross the synapse to the acoustic (eighth) cranial nerve. People who suffer from auditory neuropathy report that speech understanding, even in quiet environments, is very hard. It has also been shown that this disorder can result in auditory thresholds that fluctuate over time and for some people thresholds depend on the temperature. Treatments for auditory neuropathy vary by individual. Some people respond well to hearing aids, while for others amplifying the signal is painful and not helpful. Others receive cochlear implants and do quite well. In other cases, the person may benefit from the use of an oral interpreter who silently mouths the words so the person with ANSD can use speech-reading to understand. Other problems that can exist with the eighth nerve or the central nervous system are tumors, the most common one probably being an acoustic neuroma. Less common but equally devastating would be tumors from a genetic condition called neurofibromatosis type II. Surgery for these lesions may be to cut the eighth nerve on the affected side. In that case, amplification on that ear would not be helpful; however, that individual may find the need for a hearing aid set up to pick up environmental sounds on the affected side and send them to the other ear. This set up is called contralateral routing of signal or CROS. There are other medical conditions which might impair function of the eighth nerve, most commonly Multiple Sclerosis (MS). Hearing loss per se is not common in individuals with MS but balance problems and vertigo/dizziness are. See more information on Multiple Sclerosis. Other demyelinating diseases that may have hearing loss involvement include Charcot-Marie-Tooth syndrome, Devic Disease, Guillain-Barre Syndrome, a group titled Leukodystrophies and Progressive Multifocal Leukoencephalopathy. Hearing loss may be but often is not present in these syndromes. Auditory Processing Disorder (APD) is difficult to define. However, common symptoms of APD include trouble understanding speech in background noise, sound localization and discriminating timing differences and auditory patterns in speech. Tests developed to diagnose APD can generally be used only with people who have normal hearing, which makes APD quite different from all the other hearing loss causes in this module. Testing an individual for APD should include a typical hearing evaluation as well as a special set of tests designed to measure various auditory capabilities. Treatments for APD are varied and dictated by the specific problems that individuals demonstrate. Some common treatments include auditory training, the individual is taught to listen closely for differences in the speech signal for example; compensatory strategies, strengthening memory, attention, and/or language to help reduce the impact of APD. A third treatment type lies in making changes to the person’s environment to facilitate their listening capabilities, such as with an amplified telephone or an assistive device called a frequency modulated or FM system. Audiology Awareness Campaign: What is an auditory processing disorder?